The house at this location was one of the oldest houses in the area, possibly dating back over 900 years.. 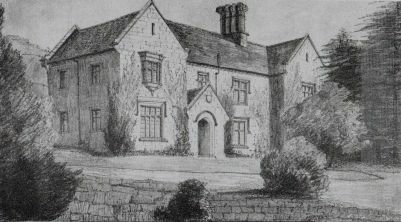 The present house was built after the previous house (Sweeney Old Hall) was demolished. Prior to demolition, the building was a beautiful timber framed house, the cellars of which are still under the present building, now called Lower Sweeney. A Mill was situated in the southern end of the farm outbuildings but unfortuanely was demolished a number of years ago. The Mill stones were kept, one is placed at the entrance to the farm yard and another two have been placed in the floor of the courtyard at the rear of the house. A search of early maps has revealed a Log Mill was also present on this site, in woodland to the south of the house alongside the driveway. 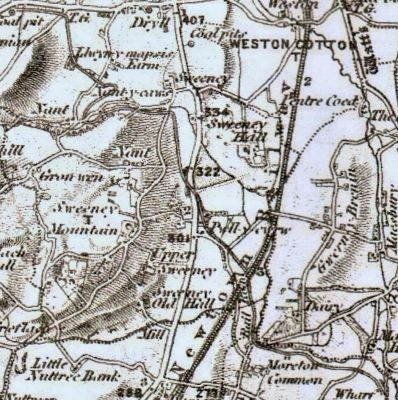 1836 map showing Sweeney Old Hall and the Mill situated south of the house. 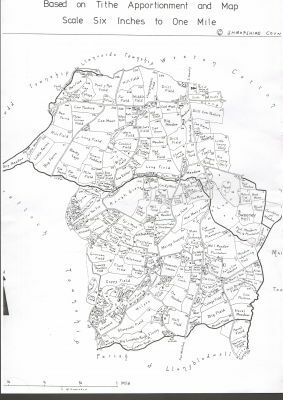 1839 Tithe Map of the Sweeney area, showing Sweeney Old Hall field at the bottom of the map. On the opposite side of the driveway is shown a Log Mill with a Mill 'Pound'. 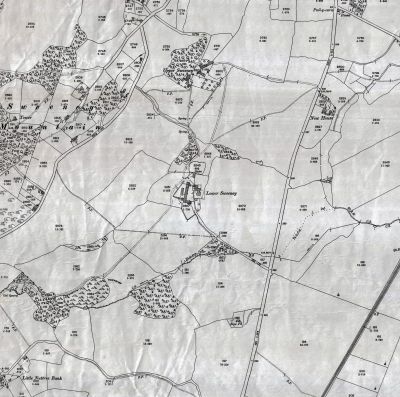 This appears to show that Sweeney Old Hall could have had 2 Mills, a Corn Mill in the outbuildings and a log Mill down the driveway..
1901 map showing Lower Sweeney. This was the site of the Sweeney Old Hall . The mill was believed to have been in the southern end of the outbuildings, but has since been demolished, the old mill stones, one being placed in the entrance to the farm yard and the other two have been placed in the courtyard leading to the rear of the house. Sketch drawn on 15th August 1892 of Lower Sweeney. 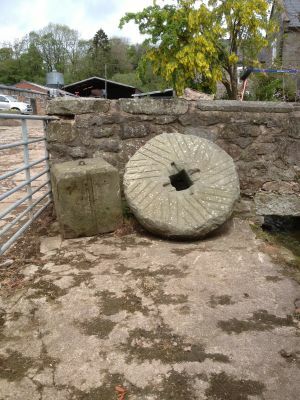 Recent photo (August 2014) of one of the mill stones at the entrance to the farm yard at Lower Sweeney. 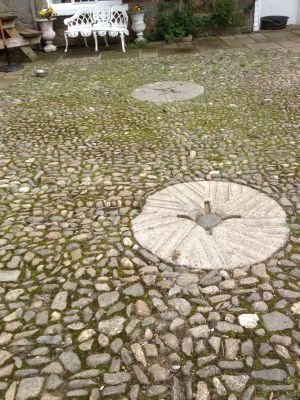 Two more mill stones placed in the courtyard at the rear of Lower Sweeney.